Dr. William Balch, a senior research scientist at Bigelow Laboratory for Ocean Sciences, holds a modern-day version of the Forel-Ule scale. Fred Bever reports on Gulf of Maine research. Over the last century the Gulf of Maine’s blue waters have yellowed. That’s what scientists at the Bigelow Laboratory in East Boothbay reported in a recent study this month, and it indicates trouble for the microscopic plants that are the foundation of the gulf’s food chain. And the findings wouldn’t be possible were it not for some overlooked 19th-century work the researchers didn’t realize was right under their noses. More than a century ago, Henry Bigelow piloted his 90-foot wooden schooner, the Grampus, into the Gulf of Maine. He was starting a 12-year, systematic study of the gulf, its fish and its plankton. He brought along a recently invented device called a Forel-Ule scope — a row of test tubes in a wooden frame, filled with colored fluids that ranged on a precise scale from blue to green to yellow to brown. With the sun at his back, the 32-year-old scientist held the rack toward the horizon and carefully noted the water’s comparative color at dozens of coordinates. For many decades, those data points, published in a 1,000-plus page compendium of his gulf work, went largely unexamined. But two years ago Dr. William Balch, senior scientist at the Bigelow Lab, took a deep dive into the treatise, which had been kicking around his office since an antiquarian bookseller sold it to him 10 years before. “I was sitting right on this chair and I was hootin’ and hollerin’, because it was just too good to be true,” he says. That’s because, for nearly two decades, Balch has been making eerily similar measurements of ocean color as he creates his own long-term baseline study of the gulf. He uses all the latest gear — he’s got an updated plastic Forel-Ule scope, electronic light meters, access to NASA satellite data, GPS and submersible data-hunting drones. But what’s being measured? It’s basically the same. 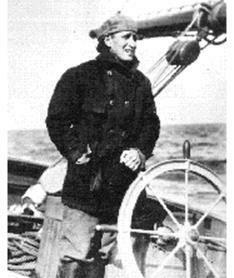 Henry Bigelow at the wheel of the Grampus. “And we had all the information we needed to then go back to calculate what were the Forel-Ule scales and then to compare them to what Bigelow saw over a century ago,” Balch says. Ocean color is a revealing indicator of ocean content. Where it’s bluest it’s purest, with the least amount of organic matter. Where it’s greener, plant life, including the microscopic phytoplankton, which provide about half the oxygen we breathe, is likely abundant. Where it’s browner or yellower, you can bet that’s dissolved organic matter washing out from shore. Balch has been using color scales and many other data points to take a close look at changes in the gulf’s biochemical systems. But until recently, he only had color data going back to the 1970s. Discovering Bigelow’s work opened the window on the gulf’s past much wider. “The coordinates are there. The temperature and salinity he measured as well, and the color. And it’s yellower. It’s extraordinary, the changes in water color now that we see compared to what they used to be,” Balch says. It’s still predominantly blue, but the range from blue to yellow is greater — about twice as wide along the scale as what it was in Bigelow’s day. And that correlates with increased precipitation scientists link to climate change. It’s washing dissolved organic material from watersheds up and down the coast into the gulf. Balch says it’s like dark, yellow-brown tea steeped from dead leaves and soil. And that, he says, contributes to massive declines in the productivity of phytoplankton. “Think of it like basically putting sunglasses over the ocean. So the phytoplankton now have to compete with the tea that’s coming in and is absorbing all the blue light that the plants need for photosynthesis. That’s one of the hypotheses,” he says. Balch and his colleagues have measured declines in phytoplankton productivity of as much as 80 percent, which may correspond with declines in some gulf species higher up the food chain. And using current models of continuing increased precipitation, he and his colleagues predict the trend will continue. On Thursday, they’ll load a cargo container full of equipment onto a borrowed research vessel and set out from Portsmouth for a three-day voyage to gather more baseline data from the changing Gulf. In more senses than one, they’ll be sailing in Henry Bigelow’s wake.